The view from the stratosphere during a flight test launched on Oct. 24, 2015 by World View Enterprises, which aims to loft paying customers to near-space beneath a giant balloon. Balloon-based space tourism is one big step closer to becoming a reality. Arizona-based World View Enterprises, which aims to loft paying customers to the stratosphere beneath a giant balloon, launched an uncrewed test flight Saturday (Oct. 26). 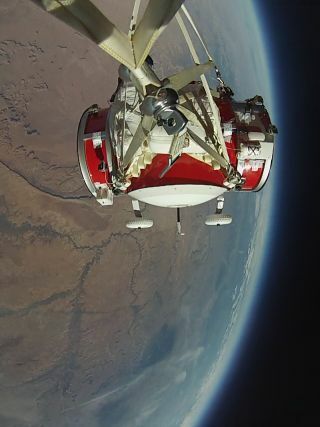 The company sent a 10-percent-scale version of its passenger capsule to an altitude of 100,475 feet (30,624 meters) above the town of Page in northern Arizona. You can see an amazing video of the flight here. Saturday's trial demonstrated that World View's system can lift off gently, successfully transition from balloon floating to aerodynamic parafoil flight at high altitudes, and descend and land smoothly, company representatives said. World View launches a flight test to the stratosphere from Page, Arizona on Oct. 24, 2015. "While each individual system has been analyzed and extensively tested in previous test flights, this significant milestone allowed us to test and prove all critical flight systems at once," World View Chief Technology Officer and co-founder Taber MacCallum said in the same statement. "Now we're ready for the next major phase of development — full-scale system testing." A full-scale, uncrewed test flight — involving a payload that weighs 10,000 lbs. (4,540 kilograms), the same as World View's final passenger-carrying capsule — should come later this year or in early 2016, MacCallum told Space.com last month. World View's vision calls for lofting six passengers to an altitude of 100,000 feet (30,500 m) in a pressurized capsule that features a bar, a bathroom and other amenities. World View customers (who will each pay $75,000) will cruise at such heights for 90 minutes to two hours, taking in the blackness of space and the curvature of the Earth. The capsule will then detach from the balloon and fly back down to Earth with the aid of a parafoil, a parachutelike device. The entire trip will take 5 to 6 hours from liftoff to landing, company representatives said. If all goes according to plan, World View should be offering commercial flights by 2017, MacCallum said. World View isn't the only company in the nascent space-tourism field, but its balloon-based, stratospheric approach is unique. Other companies, such as Virgin Galactic, XCOR Aerospace and Blue Origin, plan to launch paying customers to suborbital space using rocket-powered craft.